Step, blood oxygen, calories, distance, stopwatch, sleep monitoring, call reminder, alarm reminder, SMS phone display, social sharing (WeChat, QQ, Facebook, Twitter), etc. 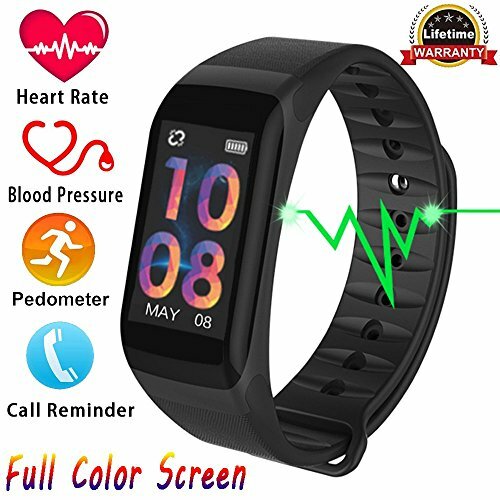 ♛ HD Colorful Large Screen - The new 0.96-inch OLED single-touch HD color large screen, You can clearly see more content in the fitness tracker even outdoors. Very slim and lightweight strap, comfortable and easy to wear. ♛ Activity Tracker - Accurately record your all-day activity data such as steps, distance, calories burned and duration of activity. Open the real-time running function of the phone app, the GPS function of the phone will start recording your sports track display map, distance, time, speed, calories burned, etc. ♛ IPx7 Waterproof Level: This fitness tracker uses the latest waterproof technology, waterproof rating reached IPx7, even if it rains, car wash, swimming, you do not need to remove the fitness tracker. ♛ 100%SERVICE GUARANTEE: We are Care about your Satisfaction Experience in First, We are Dedicated to Your Complete Satisfaction. If You Have Any Questions Regarding Our Fitness tracker, Please Let Us Know So We Can Take Care Of Any Problem. If you have any questions about this product by TIISON, contact us by completing and submitting the form below. If you are looking for a specif part number, please include it with your message.